File user license: This File can not be re-sold or re-distributed. You may use it on your personal or client projects. Â Please credit me back when you can using a link-back to Photoshopcandy â€“ or even by mentioning photoshopcandy.com in one of your blog posts. The link back is optional but much appreciated. Thanks! Glassy & Vibrant Rss feed icon Tutorial – Vista Style. Hey guys – want to see how I made this? Well its pretty easy…just takes some time…and easy to follow steps which is what I typed out for you guys! Lets begin the tutorial: Start by opening a new document – any size you want is fine. 500px x 500px is good and big. In the tools panel go select the custom shape tool. Than we go to the top of the screen and select the shape we want to use in our case it is like a yield sign triangle shape with rounded edges. Make sure all your shape properties look like this. Go to the center of your document (I will call it the work stage) Hold down on CTRL (cmnd with mac) and drag out the mouse in any direction and release it when you have reached the size you want. This will create the shape on a new layer. Rename that layer”Triangle”. The triangle is upside down now – that’s ok. Just go to EDIT>TRANSFORM>FLIP VERTICAL and viola. That should do it. Now take your cursor and place it over the triangle icon and hold down on CTRL (mac=cmnd) and CLICK. Rename that layer ” Border”. and drag it down to below your triangle layer. Make sure your “border” layer is the one selected and now go to top of screen and SELECT>MODIFY>EXPAND>and type in 10-12 px and click ok. (The more pixels you choose the thicker your border will be) you will see what I mean soon. Now hold down on alt and at the same time press Backspace. This will fill your new selection. While still on the border layer right click and click on blending options. In the blending options box check off and select the “gradient overlay ” Blend mode shouold be set to normal and opacity to 100. now click on the gradient strip to open the gradient editor options . Press ok. Do the exact same to the other stops within the gradient editor until you have this. Than press ok again. On your stage you should be seeing this. Now we are going to add a cool shine to the triangle using the gradient tool. first add a new layer -same way as done previously. Rename that layer “Shine” . With the shine layer being slected roll your mouse over the triangle icon once more and Click the mouse while holding down on ctrl. This will again give you the triangle selection . Now go to SELECT> MODIFY>CONTRACT and type in 3 pixels and click ok. Still on the shine layer – go select the gradient tool from the Main tool bar. click ok. NOw take your mouse over to your work stage. place your mouse just below the triangle and hold down on ctrl and drag upward to about half way through the triangle. Like so. and release. this will create a nice shine. Now in your layers panel add a new layer and rename it “RSS ICON” – I will not start explaining how to do this shape….as it can get complicated . SO please download this RSS ICON here – and just drag it from within photoshop to your “rss icon” layer. Resize it accordingly. This will select it..again. Go to SELECT>MODIFY>CONTRACT and type in 3 pixels – click ok.
Go to the work stage and hold down on alt. Your cursor should transform from an arrow to a crosshairs with a minus sign attached. your selection should look like this. now go select the Gradient tool from the main tool bar again. Make the foreground color white. You can set the foreground from within the main tool bar. (This gradient style should be like the last one we did – Foreground to transparent – since it was the last one you used – your properties should still be set to it – so have no worries) NOw bring your mouse to the work stage and place it just above the triangle shape and selection and drag downward to about middle of shape. The tutorial ends here…you should see this. I really hope you all can benefit from this tutorial..as i put some serious thought and time into it. If you want the PSD of this tutorial as I did it. Please contact me at aaronova@gmail.com I would be happy to send it over. Feed me ! Way cool Rss feed icon Tutorial. The next tutorial….coming very soon. 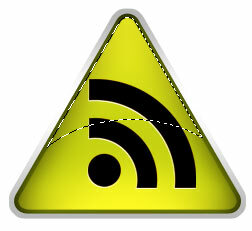 In my next tutorial I will show how to make this sweet Rss feed icon. Vista style. I will also give the PSD so you can use it on your blog or site if you like. With G-ds help – The tutorial should be up in about a week. Hey guys – after a long vacation – I am excited to be back. I am actually happy to see that web 2.0 style graphics are still the hype… I love it. I am slowly thinking that this wont be the case for long but as long as it is…enjoy the ride. 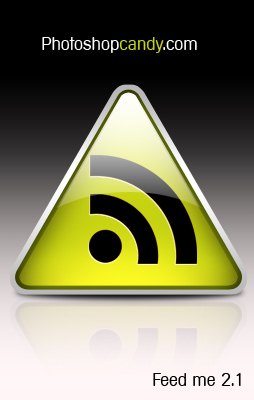 Now for you guys, I made this sizzeling hot rss feed icon – nice and compact . Now isn’t this Beautiful! What do you think? These can always come in handy while designing a site with an rss feed option. Use it wisely. If you use it on a personal site – please mention my blog somewhere on your site – this would be appreciated. If you use it on a commercial site than just leave a comment letting us know….its fun to see how far these things go. Click here for the free psd with layers intact. or GO CHECK OUT AN RSS ICON TUTORIAL -STEP BY STEP!